Why Would a Tugboat Need to STOP Motion? Yet again, I’m preparing to drive that arduous forty minutes to our airport to pick up an arriving tugboat man. This is the life of a tugboat captain’s wife. They’re always going or coming. Although he was gone the entire week, continually bemoaning the fact that he missed the giant surf, this time he wasn’t out to sea. Did you know that professional mariners need to attend lots of continuing education classes? That involves everything from keeping up with USCG (United States Coast Guard) licensing requirements, enhanced security procedures, managing a crew, practicing medical lifesaving techniques (because captains are the medical officers onboard tugboats), fire safety and prevention, and radar. There’s lots more but I can’t remember it all right now. This time he was learning and being certified in something called Dynamic Positioning. He often trains with simulators; probably this time, too. I forgot to ask, ‘cos our conversations mainly consisted of his whining and moaning about missing out on surfing epic waves. Dynamic positioning (DP) is a computer-controlled system to automatically maintain a vessel’s position and heading by using its own propellers and thrusters. Position reference sensors, combined with wind sensors, motion sensors and gyro compasses, provide information to the computer pertaining to the vessel’s position and the magnitude and direction of environmental forces affecting its position. The computer program contains a mathematical model of the vessel that includes information pertaining to the wind and current drag of the vessel and the location of the thrusters. This knowledge, combined with the sensor information, allows the computer to calculate the required steering angle and thruster output for each thruster. 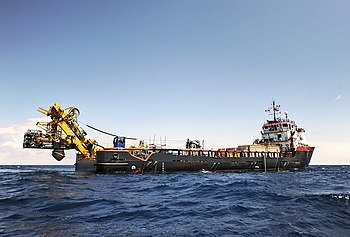 This allows operations at sea where mooring or anchoring is not feasible due to deep water, congestion on the sea bottom (pipelines, templates) or other problems. Dynamic positioning may either be absolute in that the position is locked to a fixed point over the bottom, or relative to a moving object like another ship or an underwater vehicle. Sometimes when a tug is working on a project rather than simply being underway from point A to point B, it needs to stay in one specific location and not float around. DP is an advanced method to hold a tug stationary. Today: Sometimes he’s here, sometimes he’s not. That’s the life of a tugboat captain’s wife. Right now he’s not.. The Beginning…This is the love story of me, Princess Rosebud, and the tugboat captain. Easter Sunday, April 4, 2010… At 3:40 this afternoon, I was in the threshold of our garage door that leads into the living room where I had dragged in a ladder to help with my latest project–painting the living room walls a divine shade of seafoam green–to stay busy when the captain’s out to sea. I mean, I can’t shop ALL the time. A girl has to take a break now and again, right? I set the ladder down and went back to close the garage door. At that precise moment, the glass vases on the shelves surrounding our fireplace began to vibrate and wobble. Here in SoCal, I’ve endured a handful of quakes, but never such intense shaking. Through the open garage door I saw the bicycles that hang from the ceiling sway back and forth. As I attempted to process THAT information, the crystal lustres on my grandmother’s antique porcelain candelabras clashed and clinked. Terracotta tile flooring in the foyer seemed to roll back and forth as if I was on a sailboat in San Diego Bay, and I had a difficult time standing. Feeling dizzy and unbalanced, I grasped the doorway for support. My poor kitty gave me a dirty look like I had interrupted her nap on purpose. So much for the concept that animals can sense an earthquake–not this spoiled little brat. I ran up our oak-planked steps into the family room and through the patio doors onto the deck and shouted out to the neighbors. This quake was so violent that it caused the water in their pool to slosh over the sides like a mini-tsunami. We each went back in our respective homes and turned on CNN. We discovered that there had been a 7.2 earthquake in Mexico. The first reports that came in revealed a lot of damage near the epicenter in Mexicali, but no major problems in San Diego; only broken glass and falling cans at grocery stores, which seemed pretty miraculous considering the earthquake’s size. Still spooked by the shaking and some pretty strong aftershocks, I surveyed the house, removing anything unsecured and potentially dangerous. This is as good a time as any to confess something. I’ve got shelves and shelves of seashells in every room–including the bathroom. Everyone collects seashells, right? One here, one there, as a memory of a great beach or a fun vacation, right? Well…I’m a seashell hoarder. I want ALL seashells–there are never enough seashells to collect or buy. I make things out of some of them–picture frames, mirrors, boxes–they line the walls in our two bathrooms and even our front door, but mostly they just hang out–in bowls, on shelves, anywhere and everywhere. There is no empty space in our house, and if there is, it’s quickly filled with a shell–or a rock. After a couple decades, we have come to an understanding, the captain and I. He thinks I’m crazy and obsessed with shells and rocks and driftwood, and I don’t destroy his surfboards if he doesn’t give me a hard time about it. I anxiously emailed the captain who’s half a world away in the middle of an ocean. I figured that if anything would cause him to cut his four month assignment short, this might be it. The way that emailing works in deep ocean situations is through a pretty inefficient satellite; sometimes it takes hours to complete the process. If there’s a real emergency, I have a phone number to call, but this didn’t really fit the definition. I wasn’t hurt and the house wasn’t damaged or anything. When he finally read the email and wrote back, he told me to “standby” at the house phone because he would try to make a call from the boat’s sat phone. When he called, I used all my powers of persuasion to convince him to come home, but to no avail. He simply wasn’t going to call the United States Coast Guard to fly a rescue mission a thousand miles from land to bring him home because the kitty and I were scared. Well, I know where I stand in his list of priorities. Hmmm, I wonder if this is when I hatched my plot to get that Chanel. Hmmm, I wonder. After that stressful event, and many aftershocks later, some pampering was definitely well deserved. That evening, I drew a bath in the upstairs bathroom we call the spa because it’s decorated in earthy tones with seashells and beach glass surrounding the mirrors and along the walls. I lit a fragrant and calming lavender candle, eased my body into the almost too-hot-to-stand-it water, and trickled in ginger and lemongrass aromatherapy oils. Sipping from a glass of merlot, I leaned back, closed my eyes, and my thoughts wandered. Experiencing an earthquake; the dizziness, the weightless feeling in a tub of warm water; it all reminded me of falling in love. It all felt the same… and it all started with a fifty cent cup of coffee. Newly divorced in 1990, I speed dated a few guys, including one totally boring and slightly scary man who immediately wanted me to meet his parents after the first (and last) date, along with a couple of total idiots whose combined IQs prolly didn’t equal my Border Collie‘s. Those unsavory experiences became flashing red lights–STOP! NO! THINK!–impossible to ignore–that I seriously needed to take some time off the dating circuit. It was the perfect time for a list. I’m an inveterate list maker; I prioritize my errands and even list groceries in the order of where they’re located in the store– like my own custom board game–where I start at the entrance and finish at the cash register. I wrote this particular list with the hope that if I documented the qualities desired in a significant other, the universe would deliver the right one when all the planets were aligned. Or so I dreamed. At midnight on August 7th, 1990, with a bottle of wine to seal the deal, I made a promise to myself–I would not date (or do anything else) for a very long time, and the next one would be “the one”. 1. Must call when he says he will. This is non-negotiable. 2. Must show up on time for dates. 3. Must love pets. Also non-negotiable. 4. No cigarettes. No smoking, and of course, no drugs. 5. Likes to exercise, work out, eat healthy, etc. 6. Must have gainful employment. 7. Must be nice and polite and honest and trustworthy. 8. Fidelity is of paramount importance. 9. When the time is right and he meets my son, my son has to like him. Also non-negotiable. Fast forward to a year later, the following September 1991. Sitting on a comfy boat cushion with a garden spade in my hand, I was in a state of Zen transplanting clary sage seedlings in the rear part of our yard. A lovely day; quiet except for the crows, I see out of the corner of my eye — less than a foot away from my hand — something that doesn’t look like a plant, but it’s not moving. At the exact moment my brain registers that it’s a squirrel, I can tell there’s something really, really wrong with it. Here in SoCal, we’re used to ground squirrels digging holes in our yard, eating bird seed, and being annoying. They always run away when a human’s around. But not this poor little guy. What are you supposed to do when you find a sick adult squirrel? Now we’ll proceed to commence the frustrating and annoying round of telephone calls to useless govenrmental agencies who pass you on and on like a game of “Hot Potato”. Nope, San Diego County Animal Control can’t do anything either, but they say that because it could possibly have or carry the bubonic plague, I should call the County of San Diego Vector Control. Vector Control specialist Chris informs me with a chuckle that only the squirrels on Palomar Mountain test posiitve for the plague and it’s impossible this one has the plague, maybe he “ate some bad food” but they won’t help this little critter. “Let Mother Nature take its course”, he says. When I tell him that, as a compassionate animal advocate, I’m having a hard time grasping that concept, and while I’m at it, I’m wondering what exactly it is that Vector Control does,…he suggests I try to call Project Wildlife — but, he cautions, I shouldn’t get my hopes up because squirrels don’t rate very highly on their list of animals they like to rescue. However, if I could trap it in a box and bring it to them, they would have to accept it. If you can’t picture me somehow trapping a potentially extremely sick animal and putting it in my car and driving it to Project Wildlife, that’s because it would never happen in a zillion years. A bird, yes; a dog, cat, coyote, bobcat even, but not a squirrel or a rat or a racoon that’s listlessly walking around in circles with squinty eyes. Isn’t that what these city/county agencies are for? Isn’t that why we pay taxes? I hung up before I said anything that could be classified as a threat…..
Amazingly, he called while I was keeping an eye on the sicky squirrel with a pair of binoculars. He suggested that I get the hose out and gently sprinkle it in the general direction of the squirrel to guide it away. While I was on the cell with him, I turned on the water, and with hubs encouragement, sprayed near the squirrel. Oh NO, that was the wrong thing to do! THAT MOTHERF***ER CAME AFTER ME! NOTE: He really said CANNOT and not the informal can’t. Well, thanks a whole lot, Master Captain Butthead. I won’t forget how you abandoned me in my time of need. If you want to know what it’s like to be the wife of a tugboat captain, this is a fairly accurate scenario. After we hung up, I called a few exterminators and no one seemed interested in humanely trapping the little guy. Finally, I went next door and told my neighbor about this situation because they always have grandkids around and asked him if he wanted to come over and take a look at it. He came over and kind of shooed it with a broom under the fence into his yard and went back home. I didn’t want details; I’m just glad the little guy isn’t suffering anymore. 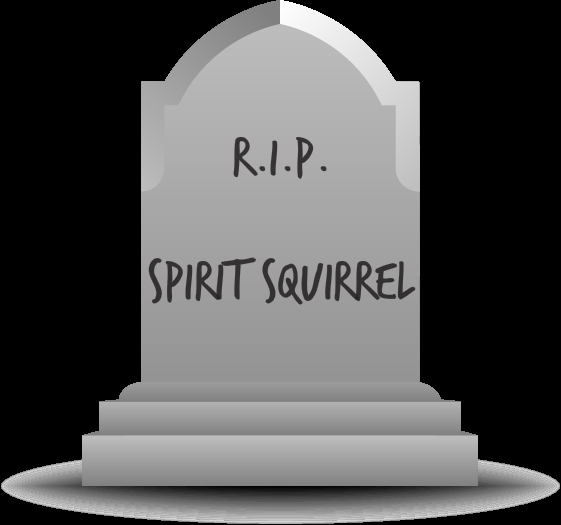 And that’s the end of Spirit Squirrel™…. RIP little buddy. UPDATE: On the news this morning…a segment about squirrels and the plague, referring everyone to the San Diego County Department of Health’s News Release. P.S. Getting started on those brownies now. T’was the night before the captain comes home! A miracle occurred and at the very last minute, my tugboat man has been released from his assignment and is on the long journey home. Because of the great distance he must travel, it takes two days but he’ll be arriving on Friday, which means another drive to the airport at midnight. It’s an unexpected joy, and in honor of this great occasion, I have written a poem based very loosely on “Twas The Night Before Christmas“. It won’t win any prizes, that’s for sure! with not a single dust bunny too far to reach. The sign says Princess Rosebud but it’s hard to see. In hopes that Capt Cranky wouldn’t be too tired to…you know, (overshare). because FINALLY my tugboat man would soon be there. And vodka and whiskey, and champagne flutes. Let’s all hope I can find that missing corkscrew. but a very, very tired husband who’s ever so kind. but last minute gifts so shiny and sheer. will sit by the fire and sip champs ever so slow. Here’s how my captain did it. He grew up around water his whole life; his dad took him sailing on major voyages to Europe and up and down the eastern seaboard. I know he thought about teaching as a career, but he chose to go to a maritime academy. (I can’t say which one.) Some people start out by working on fishing boats or join the Navy, Coast Guard, Military Sealift Command, or attend other maritime schools. In my opinion, it would be a good idea to find out if you are prone to seasickness; otherwise you’ve wasted a lot of time and money. I think you have to be pretty good in math and sciences; you need to learn GPS and radar. Before there was GPS, all mariners needed to become experts in celestial navigation; navigating by the planets. You need to learn to be proficient in reading charts (that’s what they call maps of oceans and other waterways and coastlines). Even though a captain’s job is to navigate and drive the boat and manage the crew, he (or she) needs to have a lot of knowledge about the engine room. If something goes wrong in the engine room, or the engine needs maintenance, the captain must know how to diagnose and work on these problems, even though there is an engineer on board. They need to know a lot about weather conditions because they are very affected by adverse weather. All the high-tech tools that boats are equipped with are still at the mercy of Mother Nature. If you’re thinking of becoming a mariner or you know someone who is considering it, I believe it is important to bear in mind that as captain and crew of a United States merchant vessel (whether it’s a car carrier or a tug boat) one should professionally represent our country. It’s no longer the days of Tugboat Annie or Max Miller’s I Cover the Waterfront. There’s tons of stuff I’ve left out–these are my observations and what I’ve learned from my MM. I don’t think I’d want to be the cook; they work super hard providing three meals a day and all the clean-up! Most importantly, you need to have a wonderful spouse or significant other, am I right? The one to come home to. In a large bowl, mix maple, agave, oil, spices. Add oats, mix well to cover. Cover a baking sheet with parchment paper. It makes clean up easier. Spread oats on baking sheet. Bake at 325 degrees for about 2o minutes or until lightly browned. Don’t let it burn! When it’s coolled, I add raisins, chopped dried apricots, sliced almonds. Use your imagination and add your faves. Sometimes I add flax seeds or chia seeds; depends on what’s in the pantry.